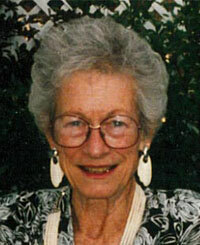 Jean Cameron Arkell, a Hailey, Idaho, resident for 38 years, passed away at Bell Mountain Village nursing home in Hailey on Jan. 30, 2014. She was 98 years of age, and died gently in her sleep of age-related causes following a short illness. Jean was born on Jan. 9, 1916, in Los Angeles, Calif., to Donald and Jessie Cameron. The Cameron family had deep roots in Nevada, so Jean grew up in Carson City and briefly in Belmont, Nev. She graduated from Carson City High School in 1933 and earned her undergraduate degree in Education from the University of Nevada in 1937. While attending university she met Jim Arkell, her future husband of 54 years. She and Jim were married in Carson City on June 11, 1939, and then moved to McGill, Nev., where Jean started her teaching career. It was here that Jean had a notable achievement for women in the period just prior to America’s entry into World War II. She learned to fly an airplane and was the only woman to successfully complete the initial class in the Civilian Pilot Training Program at the nearby Ely airport. Jean and Jim settled briefly in Galice, Ore., and then moved to Henderson, Nev., in 1942, where Jean again taught school until Jim joined the Navy. They remained in Henderson after the war, raising their family of three sons. Jean resumed her teaching career after her children were older. She was also active in PEO, Eastern Star, AAUW, Cub Scouts, PTA and her church. She became adept at crafting, knitting, sewing, pottery, gardening and preserving. She also found time to earn a master’s degree in Education from the University of Nevada, Las Vegas. Jean and Jim enjoyed family vacations in Idaho, which led to a decision that central Idaho would be their retirement home. Jim retired first to Hailey, while Jean remained in Henderson to complete her teaching career in Nevada. She moved permanently to Hailey in 1977. Jean was active in local civic and volunteer activities including Emmanuel Episcopal Church and Thrift Shop, PEO, Hailey Senior Center, library, Hospice and Souper Supper. She is survived by her sons Donald (and Laurie) of Bend, Ore., David (and Betty) of Denver, Colo.; grandchildren Elizabeth and Peter of Washington, D.C.; and sister Helen Peters (and Wes) of Allyn, Wash.
Jean was predeceased by her son Peter and husband Jim. A memorial service is planned at Emmanuel Episcopal Church in Hailey, Idaho, on Feb. 22 at 1:30 p.m. Please call the Wood River Chapel at (208) 788-2244 for further details or go to www.woodriverchapel.com. You may also leave a condolence, share a story or light a candle. In lieu of flowers, the family suggests that contributions may be made to Emmanuel Episcopal Church, PO Box 576, Hailey, Idaho 83333, or to the Blaine County Senior Connection, P.O. Box 28, Hailey, Idaho 83333.